Google Maps shows flu shot providers in the U.S.
Could H1N1 flu make the Internet sick? 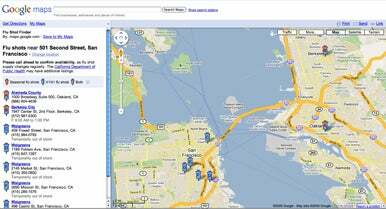 Google has launched a feature in its Maps Web site that lets U.S. residents find nearby locations for getting seasonal and H1N1 flu shots, the company announced Tuesday. Google Maps now shows locations for getting seasonal and H1N1 flu shots. Google previously launched a site where people can monitor current flu-infection levels in the U.S. and abroad. In launching the flu-shot finder, Google warned that the service doesn't yet have comprehensive data on all providers because it is still gathering that information. In addition, Google Maps won’t tell people whether a particular provider has run out of vaccines, a big issue right now with the H1N1 shot, whose production isn’t keeping up with demand. Thus, people are advised to call the providers before heading to their location.